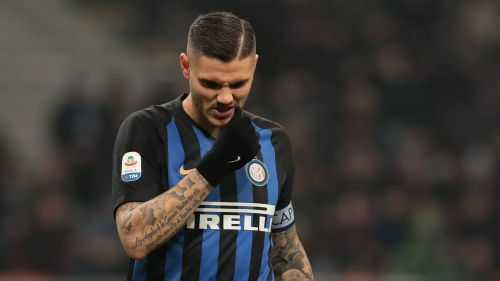 Luciano Spalletti says Inter's recovery is not all down to Mauro Icardi despite the captain's dry spell coinciding with their recent run of poor form. Despite Inter's dip, including a Coppa Italia quarter-final defeat to Lazio on penalties, they remain third in the league table ahead of Saturday's trip to Parma. Antonio Conte has been linked with taking over from Spalletti even though the Inter coach signed a new three-year contract last August. And Spalletti feels it requires a collective sense of responsibility for Inter to get back to winning ways, hinting Ivan Perisic being linked with a move away from San Siro in January distracted the players. "We missed the last piece of our immense quality, it happens to all the teams to lose players because of injury and suspension," he told a news conference. "Then there are the digressions related to the market, too. Icardi is in all of these reasons: talent is always after teamwork - If the team does not work, there is no talent and there is not a striker who can put the fortunes of the team in order, so we have to improve all together. "There are some games that deserve different conclusions: according to the statistics we tried to score more goals in the last period than when we achieved important results, we have to go to Parma to make an important performance. Now we press hard in the direction of the choices we make. "In the field we have to show a bit of heart in these matches, which is something that always makes the difference. We have to bring humility and pride to the shirt we wear. We have to work with conviction and urgency on what we must improve." And the Nerazzurri boss is focusing on the task at hand, rather than becoming concerned over ongoing rumours about his Inter future. "In the summer, we were tied for three years because we were aware that there was to be a path that would take time to be able to bring the club where we want to bring it. For me things have not changed," Spalletti added. "I'm glad for the club as well. Nobody can stop us based on what we want to develop. We take the field to honour the jersey, the fans and the club."